I love Friday. Who doesn’t? Well maybe people that work the weekend shift. Maybe they don’t love Fridays, but I start getting that light headed, giddy feeling right about now. It’s especially awesome since it’s an extended weekend and we’re going to visit my in-laws. So, what did you all have for lunch today? It is Friday after all. You know, eat-out day. That one work-day, although others do this every day (ahem), that you can eat out. I’m not against this by any means. In the almost year that I’ve worked in my new role, I’ve got out less than 10 times. Why you ask? Well have a look at the below picture. This is why. Have you heard the saying “Do something for 21 days ….” And it becomes a habit. After 10 weeks of Salad prep I am proud to say that making them has become a habit I love. I even tried to think up a new recipe this week, Veggie Goat Cheese and Chicken, you will see it pictured below. 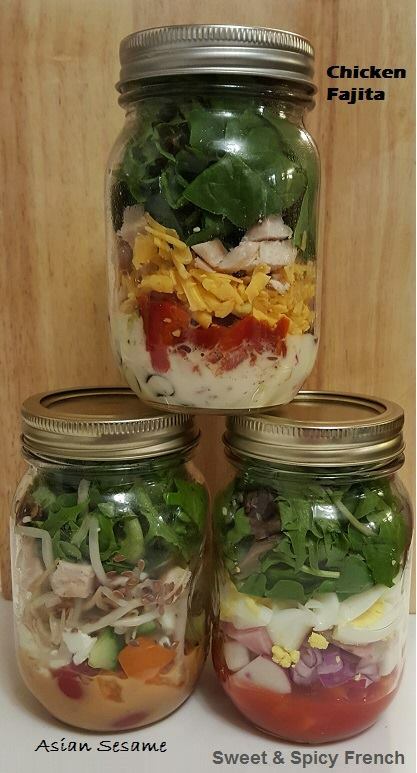 As you can see, I’ve changed the title, mostly because I think posting blogs about just Mason Jar Salads will get a bit boring. But don’t worry, I’m still going to post the pictures and recipes, however I will try to find a fitting title each week. Week 8 started off kilter. Normally I reserve Sundays for meal prep and while I knew in advance that most of my day was going to be spent at a Women’s Rock Your Biz function, I was stumped come prep time. Luckily I had gone to the big box store on Saturday, so that left just a quick “outside” aisle shopping trip to the local grocery store. I say “outside”, because every time I can do the outside aisle of the grocery store, I do an a little inner fist pump. Week 4 is here and so are two new salads (and one from last week). My family really loved the Chicken Fajita salad. So good. Week 3 is here and so are two new salads (and one favourite). I just ate the Chicken Fajita salad. YUMMY! Here is my Week 3 Salad List. Thought I’d share the document I created last week for Katie and I to make our salads.